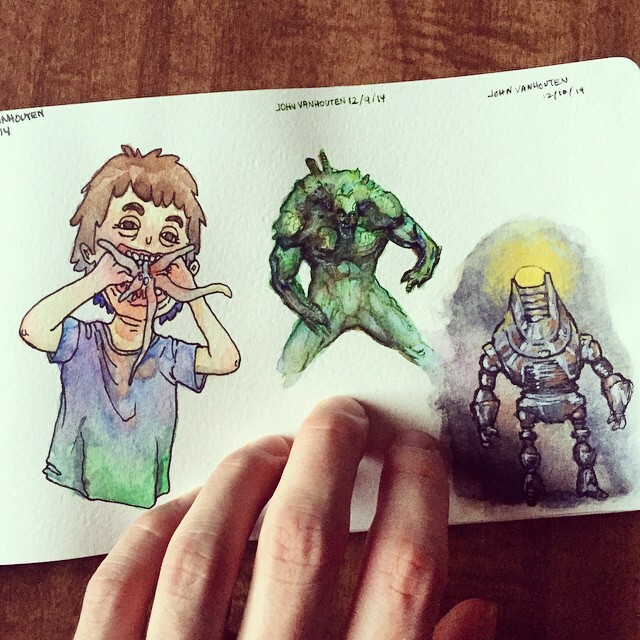 Here’s a picture of the first page of my new Moleskine watercolor sketchbook. 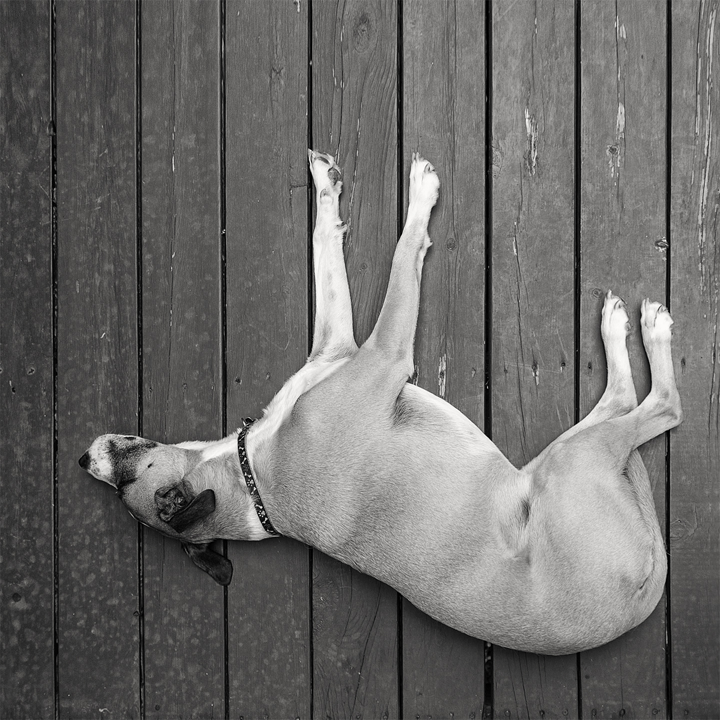 Has it really been an entire month since I last updated this blog? Boy have I been slacking off! What have I been doing, you ask? I have been reading a lot of comic books and various books about the comic book industry and it’s roller coaster of a history. I also went camping for a while and spent a lot of time taking photos. So if you didn’t know, I have a Flickr page where you can see my photography. I will be adding many glorious photos in the next couple of weeks, so keep your eyes peeled. 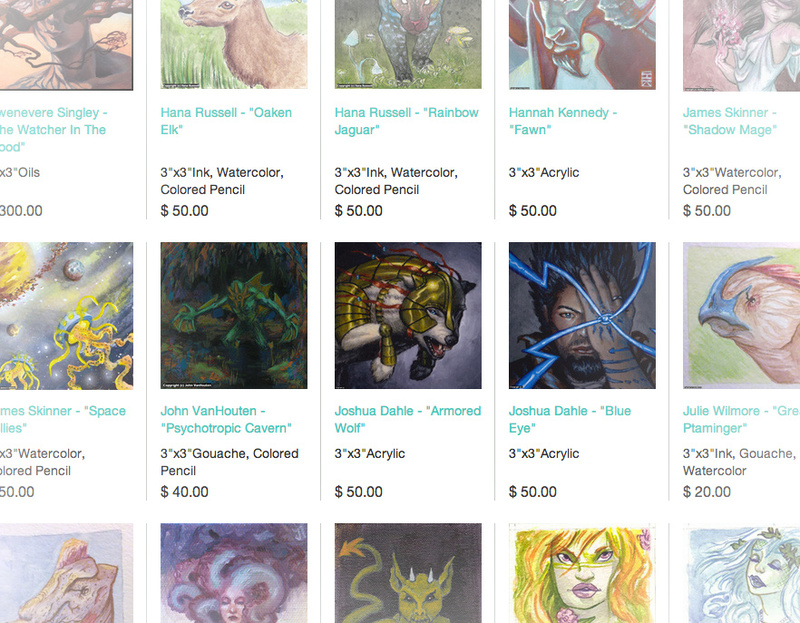 If you follow my Facebook page then you may already know about this but The Art Order has the remaining tiny paintings from the Tiny Painting show from Spectrum Fantastic Art Live 2014 for sale in their online store. 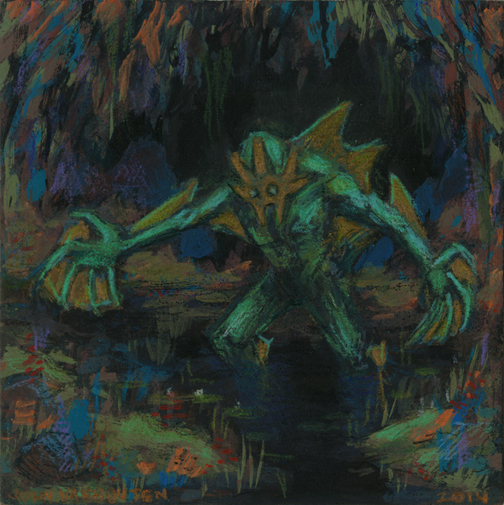 My painting, Psychotropic Cavern (from this blog post) is for sale in the Art Order store. You can go directly to my painting by clicking here. Don’t miss out on owning an original painting by yours truly, John VanHouten! Graduation and a new camera! If you follow me on my official Facebook page then you also know that I recently graduated from KCAD with an Illustration degree! If you don’t follow me on Facebook and you didn’t know that then maybe you should stay in the loop (the graduation photo below was taken by my pal Simon Lee). And what better way to celebrate graduating than purchasing a new camera? Actually I could think of a few better ways but I digress. 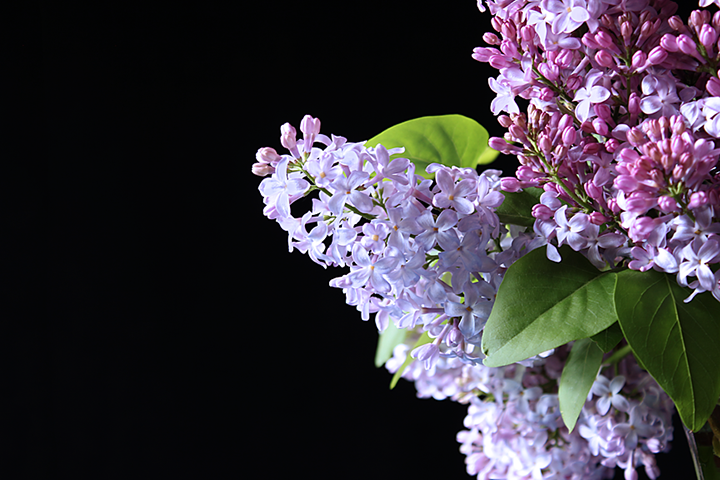 A new camera means experimenting and making up reasons to use the aforementioned new camera. 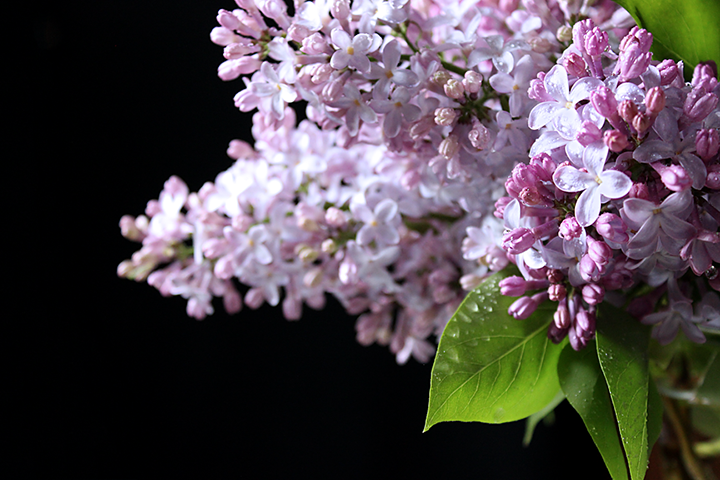 Today I photographed some lilacs (obviously seen in the photos below). Stay cool out there in that heat! It’s about time that Michigan weather realized what season it is. Because I need strong wood glue to keep a painting attached to the wood braces. Lately I have been doing a lot of prep work for future paintings. I also am looking into wood bracing (often referred to as cradling) for two finished paintings (which, now that I think about it, aren’t even on my website yet). After searching through dozens of threads on WetCanvas and AMIEN, I still wasn’t exactly sure what type of glue to use to attach the bracing to the back of the paintings but I knew that I wanted the bracing to be strong. 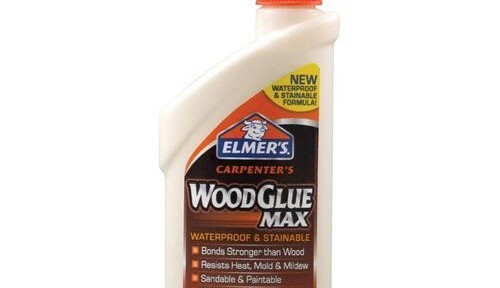 After reading about some strength tests with several types of glues, I made a not-so-quick trip to Lowe’s and I purchased Elmer’s Carpenter’s Wood Glue Max (they also offer a non “max” wood glue). For the test I used 3/16″ hardboard (often mistakenly referred to as Masonite) and 1″ x 2″ select pine wood for the bracing. I used the Wood Glue Max to glue the select pine to the hardboard. The glue was allowed to dry for 24 hours (although this test was actually done several days after gluing). As you can see, the glue held a strong bond and the wood broke instead of the glue. 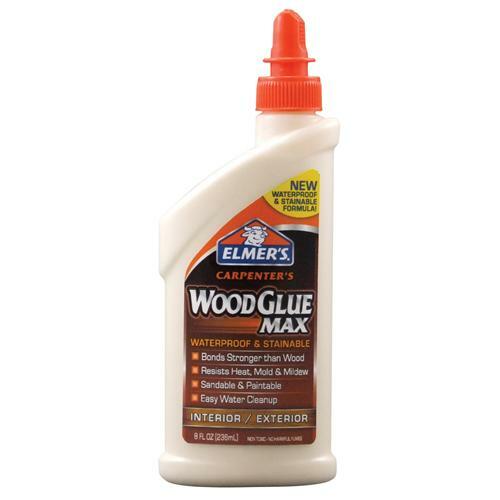 I will definitely be using this wood glue in the future, and no, I’m not being paid by Elmer’s to praise their product. 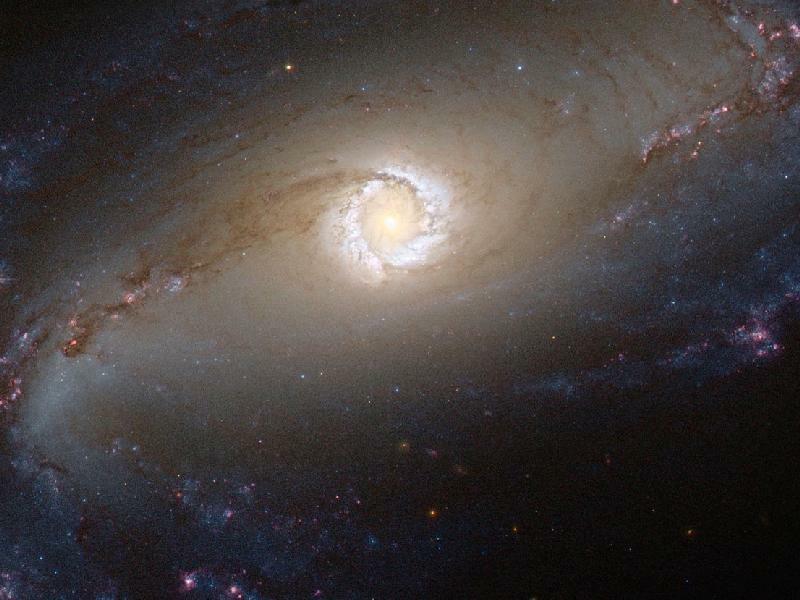 When does childlike imagination end? Look at the Drawing Development in Children table to find out! Recently while browsing the web I came across an interesting table that talked about the stages of art development in children. 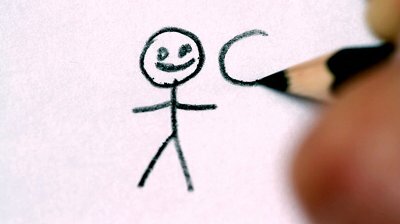 Why should you care about the drawing development of children? I think it’s worth a look as it shows us when the childlike imaginative drawings stop and when non-artists are generally weeded out. Some people think that artistic talent is some magical gift that some people receive at birth. Others think that artistic talent is the result of years and years of the blood, sweat, and tears put into practicing making art. I believe that it’s a little bit of both. You can see the table here. Everything has a beginning. This is the beginning of my art blog and portfolio. I’m John VanHouten and I have a lot of things I would like to talk about with you in the future. Art is a huge part of my life and I can’t think of anything that I would rather spend my time thinking about or doing. If you are here it means that you are either interested in art or you are at least a bit curious about it. Be on the lookout for interviews, reviews, inspiration and more! While you’re here you can check out my portfolio too. If you have any questions or comments, feel free to comment below or contact me directly. I look forward to sharing with you and talking with you. Is there anything specific that you would like to discuss?